VietNamNet Bridge – Domestic waste water goes directly into Ha Long Bay through dozens of sluice gates stretching along the route around Ha Long City. Pham Manh Hung’s house in Hong Hai Ward is located on the most beautiful road in Ha Long City. However, he cannot bathe in the sea, because the sea water is not safe enough. Some days ago, when the tide was rising, Hung decided to take a bath as he thought the water would dilute the polluted sea water. But he later had to give up. Though he swam tens of meters offshore, the water was still black and gave a bad odor. Not only Hung, but many other people also complain they dare not go to the beaches, which are just dozens of meters from their homes. Meanwhile, other people still risk swimming along the seashore, from Cao Xanh to Hong Hai Wards, because the only beach of Ha Long – Bai Chay beach – is too far from the houses of residents in 14 wards of the Hon Gai area. Tran Xuan Bac in Bach Dang Ward said he got itchy after swimming in the sea. He now goes to swimming pools instead. The swimming pools, just a few hundred meters from the shore, are full of swimmers every day. According to the Ha Long Environment Service Company, about 15,500 cubic meters of waste water enters Ha Long Bay everyday, but only 20 percent can be treated before reaching the bay. Bac said local residents ‘crave’ to swim in the sea, but they are afraid of the pollution. 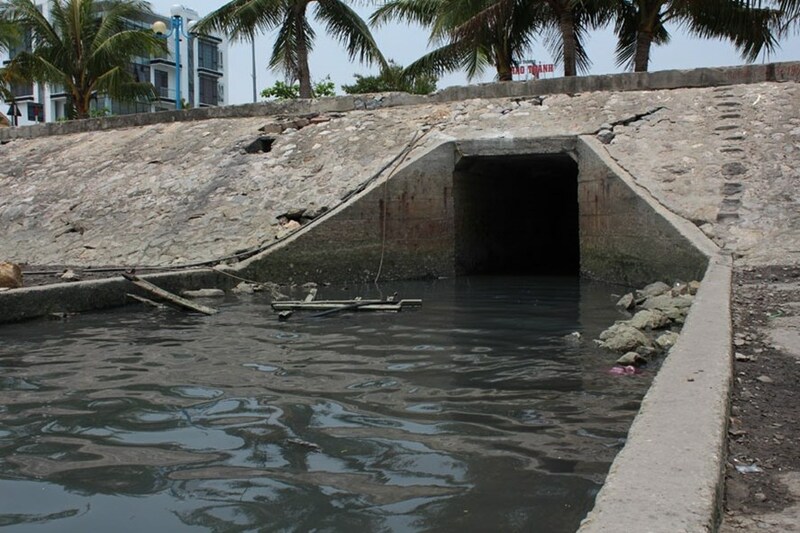 According to the Ha Long Environment Service Company, about 15,500 cubic meters of waste water enters Ha Long Bay everyday, but only 20 percent can be treated before reaching the bay, thanks to the $30 million Danish government funded waste water treatment project, implemented in 2008. In fact, the proportion of treated waste water is decreasing because of the appearance of so many sea-encroaching urban areas and multistory apartment buildings. Many new residential quarters do not have separate waste water treatment systems or treatment systems don’t connect the city’s systems. Quang Ninh provincial authorities, in an effort to protect Ha Long Bay, is seeking ODA capital from Japan for the waste water treatment project in Ha Long City. The project is capitalized at $150 million, of which $125 million would be ODA funded, while the reciprocal capital from Vietnam is $25 million. Once the project becomes operational, the domestic waste water will be treated before it goes to Ha Long Bay. The only weak point of the project is that it won’t cover the two wards of Tuan Chau and Viet Hung because of the geographical positions. Meanwhile, Tuan Chau is both a famous tourism point and large cruise ship port which has a huge volume of waste water.